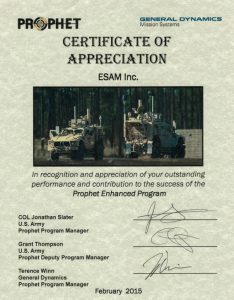 On July 31, 2014 David Matheny, President and Shareholder of ESAM Inc. accepted an award that the company received from General Atomics. 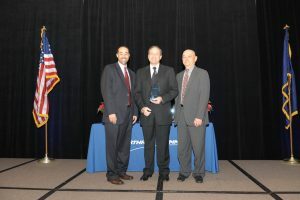 This award was in recognition of outstanding performance and maintaining the rating of “Outstanding Supplier” in the third and fourth quarters of 2012. ESAM, founded in 1974, is a high reliability supplier of Electronic Manufacturing Services. The company provides build-to-print manufacturing services of wire/cable assemblies and harnesses; electronic, electro-mechanical and electro-pneumatic complete instruments and equipment. DFM, DFT, cost reduction and reverse engineering are sub-assemblies; along with among the engineering services ESAM also offers to their customers. The company specializes in medical device, military, aerospace, capital equipment, green energy and instrumentation applications. Consistent on time delivery of high quality product at competitive prices are part of the value ESAM brings to their customers. Continual improvement is not just a slogan, but a way of life at ESAM. ESAM Inc. has achieved AS9100C certification. AS9100C fully incorporates the requirements of the ISO 9001:2008 certification. ESAM has been ISO certified since 2004. AS9100C adds additional requirements specific to quality and safety for aerospace and defense manufacturing. The rigorous audit process included a full on-site audit by Perry Johnson, an accredited registrar, to ensure that working practices observe the procedures and stated objectives and that appropriate records are kept. ESAM, founded in 1974, is a high reliability supplier of Electronic Manufacturing Services. The company provides build-to-print manufacturing services of wire/cable assemblies and harnesses; electronic, electro-mechanical and electro-pneumatic sub-assemblies; along with complete instruments and equipment. DFM, DFT, cost reduction and reverse engineering are among the engineering services ESAM also offers to their customers. The company specializes in medical device, military, aerospace, capital equipment, green energy, transportation and instrumentation applications. Consistent on time delivery of high quality product at competitive prices are part of the value ESAM brings to their customers. Continual improvement is not just a slogan, but a way of life at ESAM.